Just pick your favourite edging and decoration, tell us the size of your table, and we'll lovingly make a special order cloth for you! Measure the shortest side of your table in centimetres, then type the number into the box below. Do not add any extra for the drop/overhang. Measure the longest side of your table in centimetres, and type the number into the box below. Do not add any extra for the drop/overhang. Bridge cloths look best when they hang over the edge of the table. This is called the 'Drop'. Measure in centimetres from the top of your table downwards and decide what drop you'd like. Type the number into the box below. We will add this amount onto all 4 sides of your cloth. Please note the drop on each side plus the width of the table must not exceed 180cm, as this is the maximum width of cloth we can make from this fabric. Are you looking for a bridge cloth tailor-made for the size of your square or rectangular table? Then the bespoke Green Baize Bridge Cloth – Made to Measure is for you. Lovingly handmade by us in our workshop in Devizes, the Connoisseur Collection is a traditional range of loose card table cloths made from top-quality British woollen baize in green. 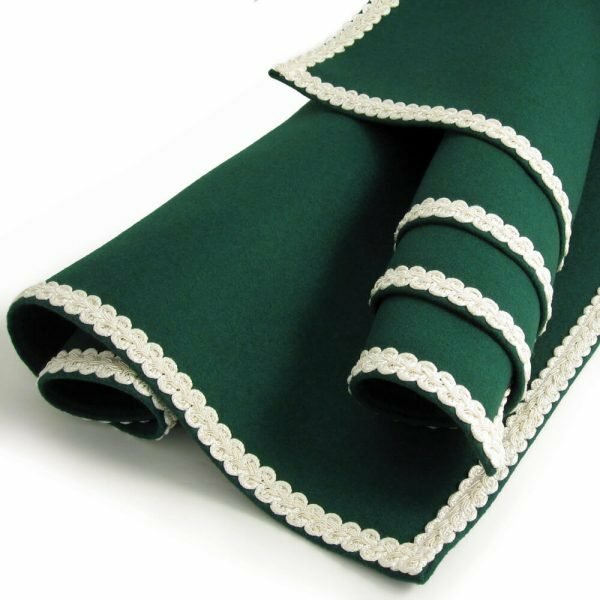 You can choose from a variety of different edgings for your Bespoke Green Baize Bridge Cloth. Choose the edging you would like. Measure the width of your table top in centimetres and type the number into the text box. The width is the shortest side. Measure the length of your table top in centimetres and type the number into the second text box. The length is the longest side of a rectangle. If your table is square, type the same number into both text boxes. Measure from the top of the table downwards and decide how much drop you’d like your cloth to have. The drop is the amount the cloth will overhang. Type that number into the last text box. We will add this amount to all 4 sides of your cloth (so if you choose 20cm, we will add 20cm to the left side, 20cm to the right side, 20cm to the top and 20cm to the bottom of your cloth). When you’re happy with your choice and you’ve double-checked the measurements are correct, add the cloth to your basket and complete the order. If you need a bespoke cloth for a table that isn’t square or rectangular, we can make one to fit. Please measure your table top and call us on 01380 829922 to discuss your requirements. If you prefer to email, please use our contact us form. The fabric we use for all our baize cloths is top-quality British-made baize which is 95% wool and 5% nylon. There is a lot of confusion about the difference between baize and felt. This isn’t surprising when you search online and find many suppliers describing felt as baize, or a fabric as ‘baize felt’ or ‘felt baize’. It’s important to know whether you’re buying baize or felt, because the two fabrics are very different. Felt is a lightweight fabric made from matted fibres of either wool or a synthetic. Being matted rather than held together in a tight weave, the fibres easily fluff up or ‘pill’ if rubbed. On the other hand, baize is a strong, dense and hard-wearing fabric made from woven strands of wool. If it’s top-quality, such as the fabric we use to make our Baize Bridge Cloths, it doesn’t pill and it will look great and last for many years. There really is no comparison between felt and the far superior baize. You can purchase a Baize Bridge Cloth from us with complete assurance that you are buying a top-quality item. Read our blog post Baize or Felt? A Guide to Buying Wisely. Important Note: Personalized products are not returnable or refundable. Personalized products are not returnable or refundable. Please double check the size of your table before adding this product to your basket. We always love to hear from our customers and leaving a review is quick and easy and lets other customers know a little bit more about the product. To leave a review click on the “Reviews” tab above.